This book provides IT security professionals with the information (hardware, software, and procedural requirements) needed to create, manage and sustain a digital forensics lab and investigative team that can accurately and effectively analyze forensic data and recover digital evidence, while preserving the integrity of the electronic evidence for discovery and trial. IDC estimates that the U.S. market for computer forensics will be grow from $252 million in 2004 to $630 million by 2009. Business is strong outside the United States, as well. By 2011, the estimated international market will be $1.8 billion dollars. 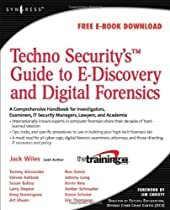 The Techno Forensics Conference, to which this book is linked, has increased in size by almost 50% in its second year; another example of the rapid growth in the digital forensics world.